i love these fabric choices. Those ... colors ... look ... sooooooo awesome!!! You just can't beat the orangey-browny-beigy mix! WOW these fabrics are gorgeous! It's my first time visiting you here on your bubble space and i really enjoyed it. :) Have a lovely merry happy day and a wonderful merry weekend! Love to you! ooooh. i'm excited - are they for moi?! dana buddy, they are actually for another cot quilt BUT i do have quite a few of the same ones earmarked for leon. still want to get to amitie and find a few that combine blues and browns in sweet prints and then i should be able to send you a pic! I'm new to your blog but intend to follow your every move! 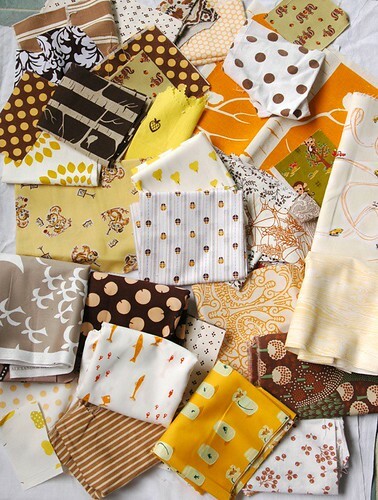 I just love the mixture of these browns and yellows. It's such a stodgy combination in my head but seeing these pulls has made me think otherwise!